Members of rival media networks condemned the actions of the group. 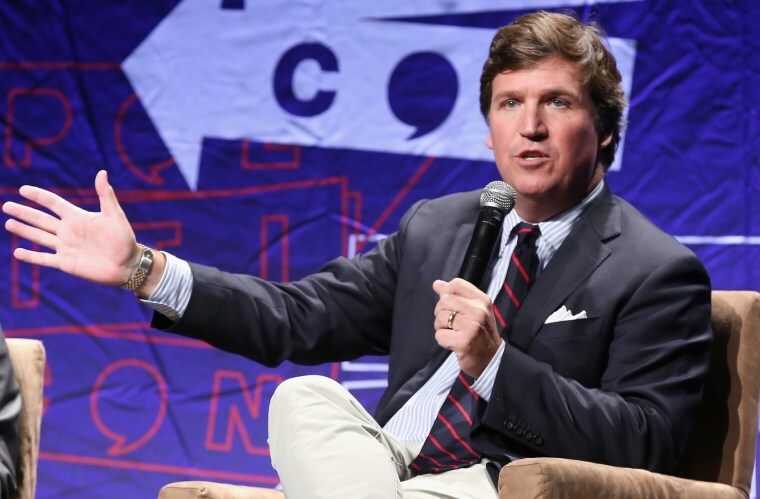 Antifa protesters chanted outside of Fox News commentator Tucker Carlson's Washington, D.C., house and vandalized his driveway Wednesday night while his wife was inside, leading to condemnation from his own network as well as media personalities from rival networks. The group Smash Racism DC, which calls itself an anti-fascist (Antifa) group, posted a video of several people gathered outside of a house. "Tucker Carlson, we are outside your home to protest. ... Your policies promote hate, and we want you to know we know where you sleep at night," someone yelled into a bullhorn. "We know where you sleep at night," the group chanted. The video has since been removed from Facebook, and it appears that Smash Racism's Twitter account has been suspended. Carlson wasn't home at the time, but his wife was and reported that she heard loud banging on her door, according to a report from the Metropolitan Police Department. Carlson told the Washington Post that the protesters also cracked his front door. The report said about 20 people were part of the group, who were chanting loudly and using bullhorns. An anarchy symbol was spray painted on the driveway, and signs with political messages were left on vehicles in the driveway and on the front door, according to police. Carlson is a staunch defender of President Donald Trump.